This entry was posted on June 16, 2014 by Goplasticpallets. Demand for Goplasticpallets.com’s range of lightweight, nestable plastic pallets has reached an all-time high as more companies that export goods are switching from solid wood pallets in favour of these competitively-priced plastic alternatives. Since the launch of its new Cabka-IPS CPP 110 PE nestable pallet last summer, Goplasticpallets.com has achieved nestable pallet sales of more than 220,000 units. Priced at just £8.05 per unit for orders of 500 units or more, and available for next day delivery direct from stock, it’s easy to see why more exporters are ‘going plastic’. Jim Hardisty, Managing Director for Goplasticpallets.com, said: “There are several explanations for this surge in demand. The main one being that there is an extreme shortage of timber supplies available for UK pallet manufacturers. The severe storms that hit the UK earlier this year and our recovering construction sector are largely responsible. Booming demand for timber in foreign markets, in particular the Middle East, Africa and China, is equally straining availability. “In fact, out of all raw materials, timber is by far experiencing the severest supply shortages and upward pressure on price, according to the latest Markit PMI Prices and Supply Monitor report. In the last three quarters, the price of UK pallet sawn timber for standard size pallets increased by more than 15 percent. 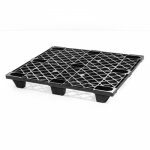 Goplasticpallets.com’s Cabka-IPS CPP 110 PE nestable pallet is completely exempt from ISPM 15 regulations and offers a cost-effective solution for export consignments. Measuring 1200mm (L) x 1000mm (W) x 130mm (H), the pallet has a perforated deck for extra lightness – each pallet weighing just 5.5kg – which helps keep airfreight costs to a minimum. As the pallet is shallow, multiple pallets nest tightly together allowing 55 per 2.4m stack – almost 2,000 in a single Jumbo truck – further reducing freight costs.